Hiring a campervan at the Gold Coast? or, in or around Surfers Paradise? We provide a comparison for all motorhome hire companies around the Gold Coast so you can get the best deals and the cheapest gold coast campervan rentals deals around. Motorhome Hire with Compare & Choose has never been so easy, we have everything you would need for your Gold Coast campervan hire deals. If your hiring a campervan from the Gold Coast you will get some great deals on motorhome rentals from our campervan rental providers. We have listed a few places for you to see and things to do on and around the Gold Coast. The Gold Coast , or the Goldie as the locals call it situated approximately 94 kilometres south of Queensland's capital city Brisbane. The true name of the Gold Coast is always a good topic of debate. Yet one thing is for sure, it was a name coined by some exceptionally insightful property developers. Today, the Gold Coast is the second most highly populated area in Queensland and is a great place to start of on your Gold Coast campervan rental adventure around Australia. The Gold Coast was uninhabited until 1823 when a gentleman by the name of John Oxley landed at Mermaid Beach. To the west, the hinterlands were filled with vast quantities of red cedars, which subsequently drew the timber milling industry to the area. It wasn't until 1875 that the area of Southport was actually surveyed, and became one of the most desirable holiday destinations by Brisbane's upper class. The establishment of the Surfer's Paradise hotel in the late 1920's was what really kick started the Gold Coast, and subsequently the area started to thrive and boom, predominately from tourism especially throughout the 1980's. The tourism boom still continues today for the Gold Coast for both national and international tourists. With its sunny sub-tropical climate, lush rainforest hinterlands and golden sandy beaches what else could you want. The skyline of the Gold Coast is quite spectacular with some of the highest buildings residing on the winding coastline. For families with children, the Gold Coast is a paradise for the young and young at heart. Some of Australia's best theme and fun parks are located here such as Warner Brothers Movie World, Sea World, Wet n Wild World, Dream World and the home of the legendary Australian Outback Spectacular show. The Cavill Avenue mall is the beating heart of the Gold Coast. This is where you will find all of the action happening during the day, through the night, and into the small hours of the morning. With an array of bars, restaurants, eateries, retail shops and nightclubs there's something for everyone. For the punters there is also Jupiter's Casino which is located in Broadbeach. There are a stack of beautiful beaches scattered along the greater Gold Coast region. Apart from Surfer's Paradise beach which is right across the road from the mall, some other popular beaches include Burleigh Heads, Kirra, Coolangatta, Broadbeach, Mermaid Beach, Miami, Palm Beach, Currumbin and Tugun. Activities and attractions abound on the Gold Coast. If you're looking for ideas, why not consider having dinner at Dracula's Theatre Restaurant, visit Ripley's Believe It Or Not, Currumbin Wildlife Sanctuary, Springbrook National Park, SkyPoint Observation Deck, the Glow Worm Caves, David Fleay Wildlife Park, Coomera Falls, Tamborine National Park, Infinity or the Wax Museum. As far as accommodation goes, there are more dormitories, hostels, motels and hotels than you can poke a stick at, for absolutely any budget you can imagine. If you really want to live it up, why not spend a night or two at the Palazzo Versace! 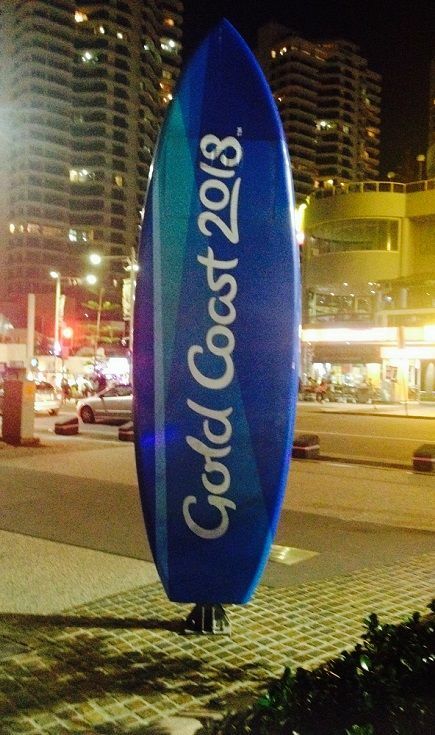 And just to top it all off, the Gold Coast will be proudly hosting the 2018 Commonwealth Games. Given that it has a suburb named Surfer's Paradise, it should come as no surprise that the Gold Coast has long been considered a haven for surfers. There are more than 35 beaches available, making it difficult for visitors to choose. Standout beaches do include the Mermaid Beach, Narrowneck, and the Spit. It is expected that the tourist boom that the Gold Coast is going to experience with the 2018 Commonwealth Games is going to provide a boost to the local economy that is going to have a long-lasting impact. If you want to explore the magic of the Great Hinterland Walk and get away from the beach for a moment, this is the perfect place to do so. Go through the World Heritage rainforests Springbrook and Lamington, here you can find a spectacular waterfall and an ancient volcano amidst native wildlife and incredible natural beauty. You can find your favourite movie characters, extreme rollercoasters, and water parks at the Gold Coast theme parks. You can travel to Warner Bros. Movie World and meet cartoon characters on Main Street, or experience the Justice League 3D ride. You can also enjoy Dreamworld or frolic with the dolphins at Sea World. If you want to experience nature from another angle (15 meters above the ground), the Tree Top Walkway is the perfect place to start. It puts you right in the midst of the canopy and spans across nine suspension bridges. You will have to do some climbing, but the Walkway is free to use. Stroll down to Budds Beach and enjoy a waterview table at Bumbles. Alternatively, you can travel to Surfers Paradise for a cool night scene and excellent coffee at Black Coffee Lyrics. Nobby Beach has the amazing Hellenika, while Salt Grill is an tremendous offering from celebrity chef Luke Mangan. If you are deciding to choose a Motorhome Hire Vehicle we have some great camping sites that can be found which enable you to stay overnight in you camper van. Here are a list of recommendations when staying on the Gold Coast. The Big 4 holiday parks have some excellent pitches for you to hook up your RV. There is plenty of entertainment and camping resources to choose from. They have been established since 1979 and have over 180 holiday parks around Australia, well worth a look. Lamington National Park Camping Ground is a camping area in the Green Mountains section of Lamington National Park, and a privately-managed campground adjacent to the Binna Burra section of the park. Both camping areas have facilities and are within short walking distances to all graded walking tracks.